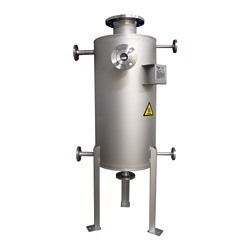 The TLV flash steam condenser (SR) allows the re-use of flash steam at atmospheric conditions. It consists of a specially-designed spiral pipe heat exchanger in a compact tank. The SR can be installed next to the condensate tank. In addition to saving energy, the SR also offers the additional benefits of adding very little backpressure to steam-using equipment and the elimination of unsightly steam clouds in plant environments. Exhaust steam flows into the top of the exchanger as cool water enters the heat transfer coil from the bottom and flows upward toward the top of the exchanger. The steam is cooled upon contact with the heat transfer coil containing the cool water and condenses, transferring its latent heat. As a result, the temperature of the water in the coils rises. The resulting condensate drips down to collect in the base of the exchanger. Once the condensate level rises high enough, it flows over the top of the drain pipe and is discharged. The formation of a controlled hydraulic seal ensures that no backpressure can be formed upstream. The water seal breaks down at high pressure; excess flash steam is discharged via the vent line. Efficient energy recovery in confined space by efficient heat transfer.